Marigold is mostly known for its pretty and colorful appearance in the garden, but it also offers some medicinal properties that can be useful to humankind. Learn about its various benefits below. Although there are many different species commonly called "marigold," Tagetes is the true marigold, also known as 'French' or 'Mexican' marigold. These names are indicative of where the plant is believed to have originated, but now marigold has become a naturalized plant across much of the world, and its uses are interesting and varied. Beyond its ornamental value, marigold has been used for centuries to treat a variety of health conditions. Similar therapeutic uses of marigold can be found in Chinese, Mexican, European, and Native American ancient medicinal traditions. Treating bacterial infections. Marigold contains antioxidants that can combat harmful bacteria that come into contact with the body. Relieving pain. Marigold is also believed to possess analgesic properties that are able to trick pain receptors, thereby inhibiting the sensation of pain. Marigold is also thought to be beneficial for eye health, since it contains antioxidant compounds that help prevent age-related diseases, such as cataracts and age-related macular degeneration (AMD). Traditionally, marigold has been used in a range of other ways. The plant has long been prescribed to alleviate flatulence, piles, kidney problems, ulcers, and boils. It is possible that some of the plant's chemical compounds are somewhat useful in these applications, but they have not become commonplace because there are many other preferred treatments available. The flavonoids and terpenoids found in marigold's flowers and leaves have antioxidant and antibacterial properties, which have proven effective against harmful microorganisms such as Pseudomonas aeruginosa and Escherichia coli, both of which can lead to unpleasant infections, especially in the stomach and the urinary tract. Tagetes species also contain high amounts of lutein and zeaxanthin, which are xanthophylls that belong to the carotenoid family and exhibit powerful antioxidant and analgesic actions. Many studies indicate that lutein and zeaxanthin reduce the risk of chronic eye diseases, including macular degeneration and cataracts. Other antioxidants recognized in marigold are dihydrotagetone, ocimene, tagetone, and limonene. The collective presence of these chemical compounds has shown anti-inflammatory, carminative, and diaphoretic properties, which are useful in treating rheumatism, peptic ulcers, and fever, among other health conditions. Herbs with analgesic properties are allspice and cloves, while blueberry and lemon also provide antibacterial benefits. Marigold is generally considered to be safe for both ingesting and topical use. However, it can trigger ragweed allergy, which is considered one of the main seasonal allergies and is caused by contact with the plants or pollen from Compositae species, such as marigolds and sunflowers. Symptoms include eye irritation, sneezing, runny or stuffy nose, itchy throat and ears, and difficulty breathing. Marigold has not known interactions with with other drugs; however, those who are taking medicine for any serious conditions should always speak with their doctor before regular intake of any supplement. Likewise, pregnant and breastfeeding women are advised to consult a health professional before using marigold preparations. There are various options available to those who wish to consume marigold for medicinal purposes. Because it is not one of the more popular natural remedies, supplements are not commonly stocked by herbalist shops; however, medicinal preparations using the leaves and flowers of marigold are easy to make at home. The powder of marigold flowers is particularly popular in India, where the preparation is widely available and used in many traditional recipes. Infusion. This is usually recommended for treating infections inthe throat or in the gastrointestinal tract. The antibacterial properties of the plant can access the affected area efficiently when consuming it in this way. Powder. Marigold flowers are dried and ground to obtain a powder that can be boiled in water, filtered, and drank to treat throat inflammation and peptic ulcers, or taken as a supplement for eye health. Tincture. The crushed leaves and flowers of marigold can be submerged in alcohol to create a concentrated solution, which should be diluted with water before ingesting. This preparation has a long shelf life. Ointment. Suitable for topical use, ointment can be applied to soothe inflamed skin and relieve pain caused by external irritation. Capsules. Taking capsules is a great way to concentrate the benefits of marigold in controlled doses, and it is ideal for those who wish to complement their diet with an extra antioxidant supplement. It is possible to purchase fresh marigold flowers online, and their availability may increase due to the modern trend of decorating food with natural ingredients. Otherwise, cultivated plants are available at garden centers, which can be harvested for personal use. It is possible to buy dried marigold flowers online, and in some natural health shops, to be used for making tea. Dried and ground flowers can also be bought online for dyeing purposes. Remedial forms and supplements of marigold can be bought online and in select specialized health stores. They are supplied by different brands, and therefore, the concentration of the herb and its chemical properties are likely to be inconsistent. This means that thorough research is necessary in order to confirm which supplement is suitable for the desired use. Marigolds are one of the most well-known ornamental plants, and they can be found in gardens and parks, as well as growing in the wild all over the world. Their rich color and interesting arrangement has secured the plant's place as one of the most coveted flowers. It is fairly hardy to most environments, but some awareness of its preferred conditions is beneficial when attempting to cultivate it. Marigold plants need plenty of sunlight to grow. They like well-drained, moist, slightly acidic soil, with an ideal pH range of 6.0 - 6.6. Lower levels of acidity can cause iron toxicity. Marigold seeds should be planted around 12 - 18 inches (30 - 45 cm) apart. In order to ensure successful germination in three to five days, a temperature range of 70 - 75°F (21 - 24°C) is advised. After being planted in early spring, they grow very quickly and will be in full bloom by July and through the whole summer season. To keep the plants blooming all summer, dead flowers should be removed regularly. Detailed information about growing marigold can be found in the herb garden section. There are a few different plant species that are commonly referred to as marigold, but Tagetes is the type that is most often used for medicinal purposes. It can be an annual or perennial plant, and on average, it grows to between one and three feet (30 - 90 cm) in height. Bright yellow, orange, or golden flowers develop at the top of an erect stem, from which medium-sized, slightly-spiked leaves also grow. Tagetes is a genus that belongs to the Asteraceae or sunflower family, which is composed by 2,000 genera and over 30,000 species. Some well-known Asteraceae members are artichoke (Cynara cardunculus), calendula (Calendula officinalis), chicory (Cichorium intybus), and dandelion (Taraxacum officinale). The genus Tagetes consists of 53 accepted species, the most noteworthy being Aztec marigold (T. erecta), French marigold (T. patula), and stinking Roger (T. minuta). These three are known to possess medicinal properties. However, many different marigold cultivars have been developed for ornamental purposes. Another herb, Calendula (Calendula officinalis) is often called English marigold, or pot marigold, and belongs to the Asteraeae family but it is a completely different species. The botanical name Tagetes is thought to be a tribute to the Etruscan god Tages, who is said to have emerged from the Earth with divine power. There is, however, some dispute about the truth of this claim. Plantarum seu Stirpium Historia (1576) is the first known report about marigolds in the West, and was written by the Flemish botanist Matthias de L'Obel. Marigolds are largely cultivated for ornamental purposes rather than medicinal. In recent years, Tanzania and Thailand have become the primary exporters of marigold seeds, and the biggest importer is India. In November 2016 alone, India purchased over 220 pounds (100 kg) of marigold seeds, which cost around $338,000 USD. Traditionally, Mexicans believe that the rich color and scent of marigold flowers guide the spirits of the dead to their respective altars; thus, marigold flowers are very popular during the Día de los Muertos (Day of the Dead), an important festivity annually celebrated in Mexico. 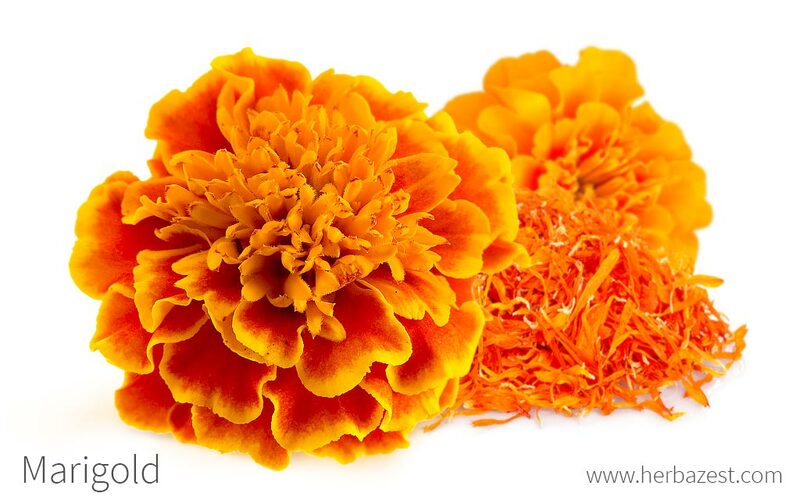 Marigolds are also prominent flowers in many Indian ceremonies and rituals. In this country, marigold is sometimes known as the "herb of the sun." It appears in decorations at weddings and other important ceremonies to bring peace and prosperity. Gardening. marigold plants are popular among home gardeners as an ornamental. Dye. The bright red-orange pigment extracted from marigold flowers is used as a natural food dye. Common uses for marigold pigments include beverages, confectionery, dairy products, and bakery. Decoration. While the marigold flowers are edible, they are not usually consumed as a food, but they are becoming popular in gastronomic circles, where their bright colors are used to garnish many dishes. Pest control. Studies have been carried out that reveal that marigold can be used to deter pests when farming vegetables such as onions. This use is preferred by those who cultivate organic produce. Marigolds remain one of the less popular natural remedies in herbalist circles, possibly because many other plants offer similar benefits in higher concentrations; however, due to its ornamental and medicinal value, marigold is worth having on hand in any garden or backyard.